OSHA announced it had recently renewed its alliance with the National Association of Women in Construction (NAWIC) to continue to promote safe and healthful working conditions for women construction workers. NAWIC provides educational and professional development opportunities to more than 4,000 women working in the construction industry. The five-year alliance will focus on hazards that impact women in construction, including personal protective equipment selection, sanitation, and workplace intimidation and violence. Participants will share information with employers and workers in recognizing and preventing these and other workplace hazards. Participants will also learn about OSHA campaigns, including the National Safety Sand-Down to Prevent Falls in Construction; Heat Illness Prevention; and the Safe + Sound Campaign for Safety and Health Programs. Through the Alliance Program, OSHA collaborates with various groups committed to worker safety and health. 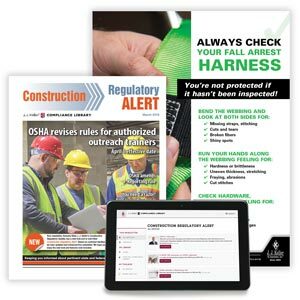 Alliance partners help OSHA reach targeted audiences to give them better access to tools and information. J. J. Keller® Construction Regulatory Update keeps you up-to-date with 1926 regulatory changes and new safety information.